As of September 1, 2010 a new class of vehicle has been created by the Vermont Legislature (Senate Bill 282, 2009 - 2010 Legislative Session); “Motor-driven cycle”. Previously known as “Mopeds”, a Motor-driven cycle means any vehicle equipped with two or three wheels and has a combustible engine that is 50ccs or less, which will propel the vehicle at a speed not to exceed 30 miles per hour on a level road surface, and which is equipped with a power drive system that functions directly or automatically only, not requiring clutching or shifting by the operator after the drive system is engaged. These vehicles are no longer required to have pedals for propulsion (now optional). Prior to this legislation, some vehicles fitting this classification were required to be registered as motorcycles; this is no longer the case. These vehicles must now be inspected in the same manner as prescribed for mopeds. If all four of the following statements are true, you must register as a “Motor-driven cycle”. If any of the following statements are NOT true, you must register as a “Motorcycle”. 1. The vehicle has a seat or saddle for the use of the rider and is designed to travel with not more than three wheels in contact with the ground. 2. The vehicle is designed to travel at 30 miles per hour or less on a level road surface. 3. The vehicle has a combustible engine that is 50ccs or less. 4. The vehicle shifts automatically. 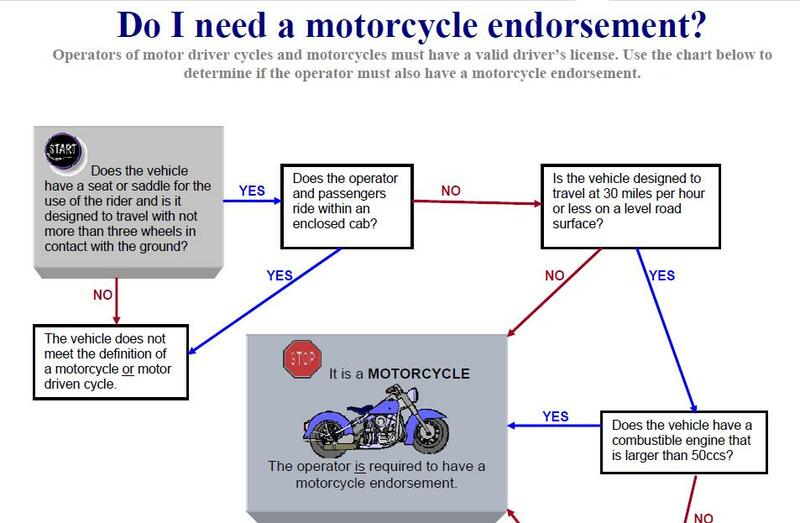 Operators of motor-driven cycles are not required to have a motorcycle endorsement, but are required to have a valid driver's license.